GUATEMALA. 1874 P AV 5 Pesos. PCGS MS62. KM 198; Friedberg 45. GUATEMALA. 1929-(L) CU Centavo, Un. PCGS PR65BN. London. KM 247. 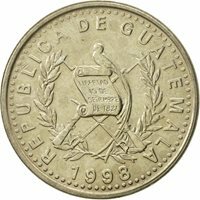 1962 Guatemala. 50 Centavos Silver Coin. LARGE EXOTIC COLLECTION/LOT OF UNCIRCULATED WORLD COINS INCL SILVER JFK DOLLAR! !